Describe Tool Length Offset (TLO) for each tool. Verify part zero offset(XY) using MDI. Describe the setting tool offset. Verify Tool Length offset using MDI. 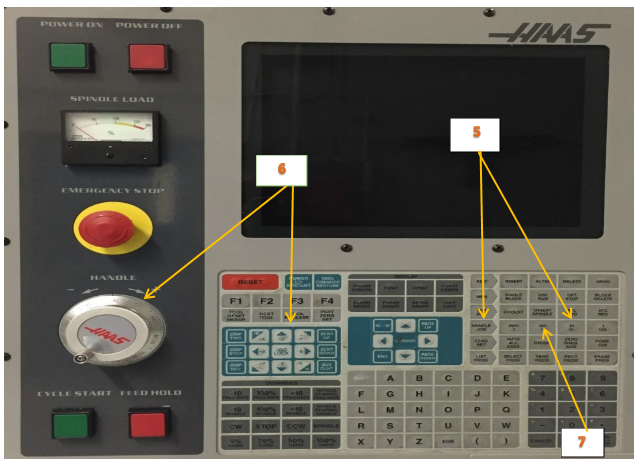 Describe the procedure of load CNC program. 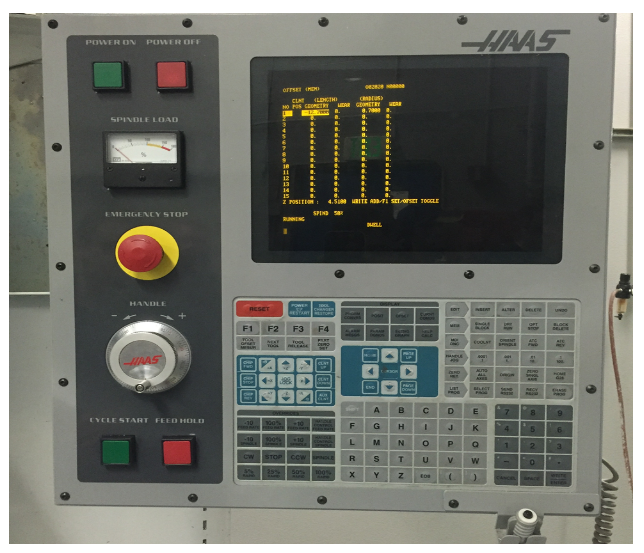 Describe the procedure of save CNC program. 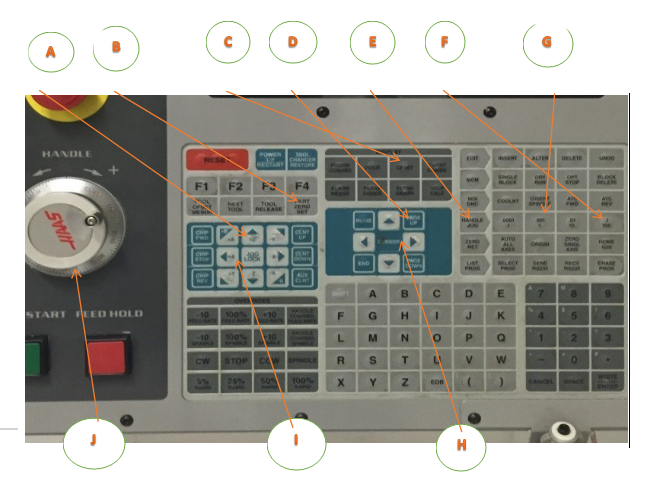 Explain how to run CNC program. Describe the use of cutter diameter compensation. Describe the shut down program. 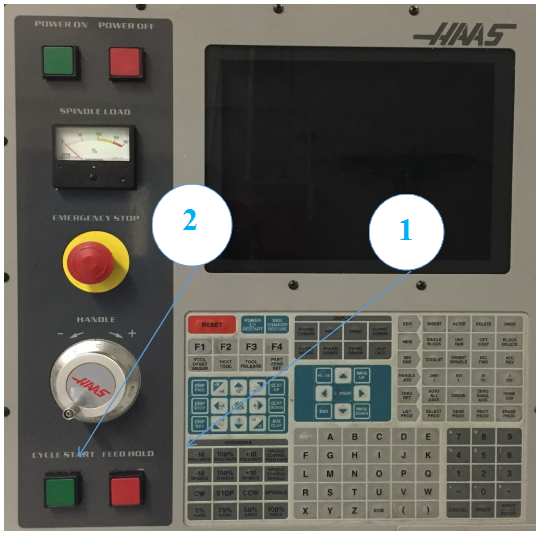 The Haas control is shown in Figures 18 and 19. Familiarize yourself with the location of buttons and controls. Detailed instructions on the following pages show how to operate the control. 5. Ensure Emergency Stop is not tripped. If it is, twist red knob right to release. 6. Wait until message 102 SERVOS OFF appears before proceeding. 9. Ensure doors are closed and work area is clear. 1. Mem: Select and Press Mem. 1. 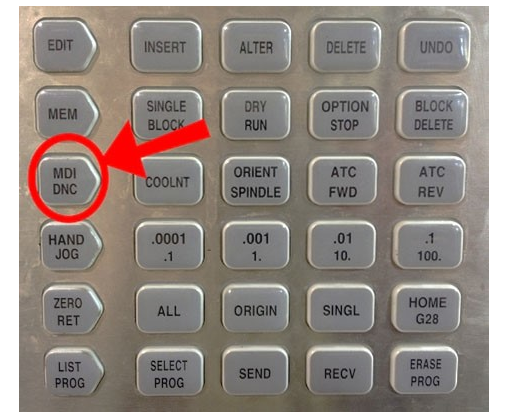 MDI/DNC Key: Press the MDI/DNC button. Press the T and then the 1 buttons. 3. ATC FWD: Press the ATC FWD button. Tool carousel will index to T1 position. Do not grip by tool cutting flutes! Ensure tool taper is clean. Grip tool holder below V-flange to prevent pinching. Ensure “dogs” on spindle line up with slots on tool holder. Machine will blow air thru spindle to clear debris. Gently push the tool upward and then release the Tool Release button. Ensure tool is securely gripped by spindle before releasing it. 6. Repeat steps 2-5 until all tools are loaded. 1. Choose one of the offsets pages. 2. Move the cursor to the desired column. 3. Type the offset value you want to use. 4. Press (ENTER) or (F1). The value is entered into the column. 5. Enter a positive or negative value and press (ENTER) to add the amount entered to the number in the selected column; press (F1) to replace the number in the column. the machine must establish its home position. The control does this at machine power-up. 2. Press the desired axis (+X, -X, +Y,-Y, +Z, -Z). 3. 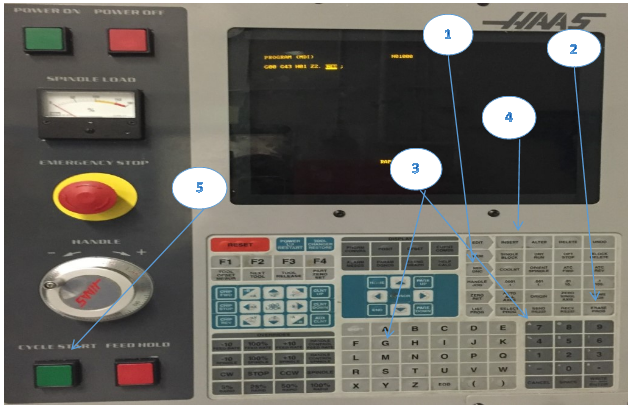 There are different increment speeds that can be used while in jog mode; they are (.0001), (.001), (.01) and (.1). Each click of the jog handle moves the axis the distance defined by the current jog rate. You can also use an optional Remote Jog Handle (RJH) to jog the axes. 4. Press and hold the handle jog buttons or use the jog handle control to move the axis. 1. Handle Jog Mode: Select the Handle Jog button. 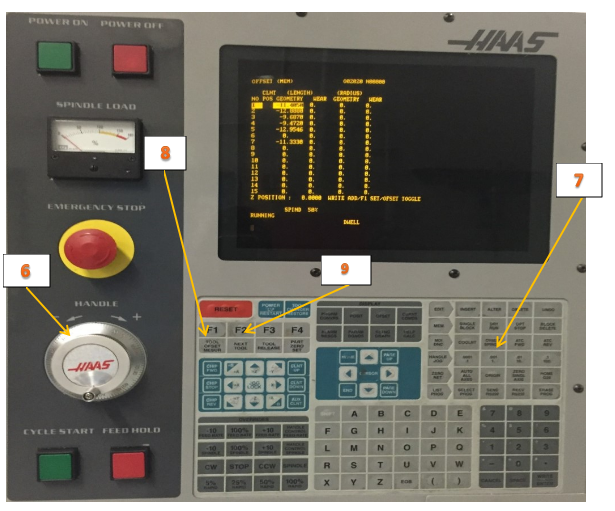 This sets machine to be controlled by the hand wheel. This sets the job increment so each click of the hand wheel moves the tool .01 inches in the jog direction. This sets the tool to move in Z when the jog handle is moved. Use the Up-Dn cursor keys (if needed) to move the highlighted bar on the graphics display over the offset values for the currently active tool. Jog so tool is below top block. Apply slight pressure to block against tool. Use Jog Wheel to raise tool until the block just slides underneath it. Move block out of way and then move tool back down .01 inches below top of block. Reduce jog increment and use jog handle to raise tool in .001 increments until it just slides under the block again. This causes the control to enter the current position of the tool in the length offset register. Make sure the tool length number updates before proceeding. This causes the current tool to be put away and the next tool to be loaded. Repeat steps 1 thru 9 until all tools are set. • The spindle must be off. • Never place your hand between the tool and the workpiece. • Ensure the correct axis and jog increment are set before jogging. • Move the handle slowly and deliberately. Keep your eyes on your hands and the tool position at all times. • Never allow anyone else to operate the control when your hand is in the work area. 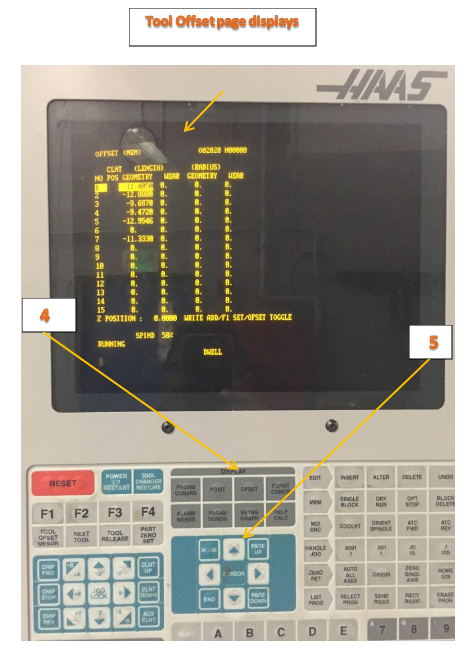 The Manual Data Input Mode (MDI) is one of the modes your CNC machine can operate in. The idea is to enter G-Codes or M-Codes on a line which are executed immediately by the machine–you don’t have to write an entire g-code program when a line or two will suffice. MDI offers a lot of power while requiring very little learning. 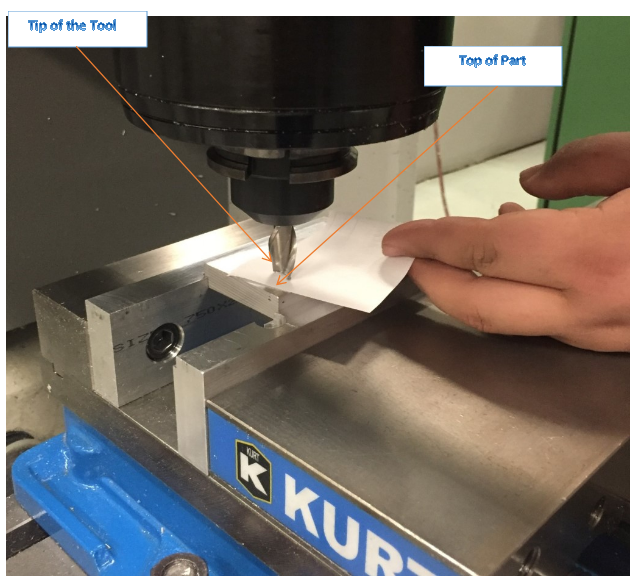 You can even use MDI commands to machine your part. 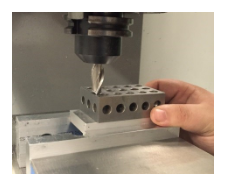 With MDI, CNC can be quick and dirty just like manual machining. 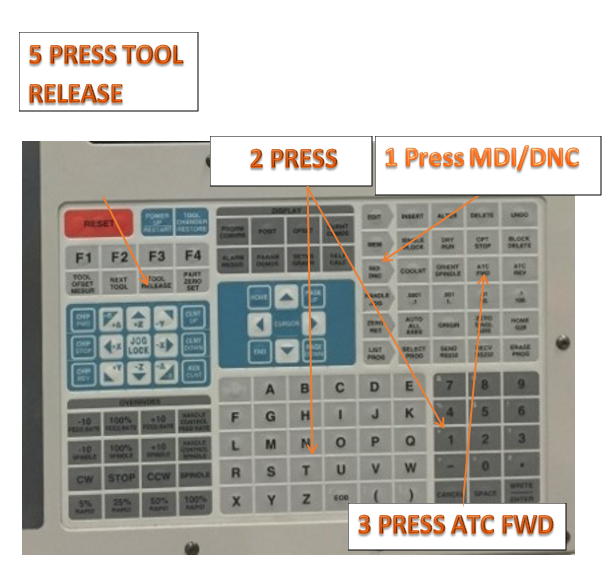 Press the MDI key on your CNC control panel to go to MDI mode. Select jog direction and use handle as required to place edge finder stylus alongside the left part edge. Move edge finder slowly until it just trips off center as shown below. • Jog straight upward in Z until edge finder is above part and jog handle reads zero on the dial. 9. Jog Handle: Set jog direction to +X and rotate handle one full turn clockwise. 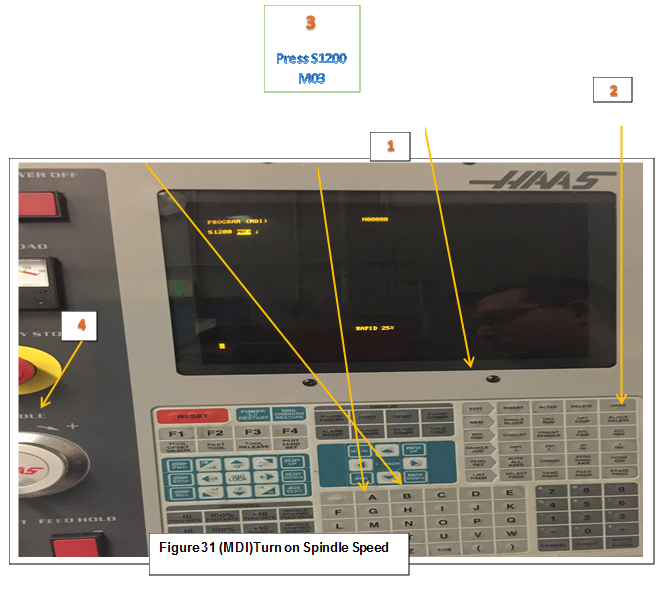 Since the control is in .001 increment mode, rotating the dial exactly one full turn places the center of the spindle directly over the left part edge. • Select Offset button and PgUp/PgDn buttons until Work Zero Offset page appears. Use Arrow keys to highlight G54 (or whatever fixture offset is to be set). • This sets the G54 X value to the current spindle position. To shift the datum RIGHT in relation to the machine operator, ADD a shift amount to the offset X-value. For example, to shift X+.1, input .1 WRITE/ENTER. 1. Place the material (1) in the vise and tighten. 2. Load a pointer tool (2) in the spindle. 3. 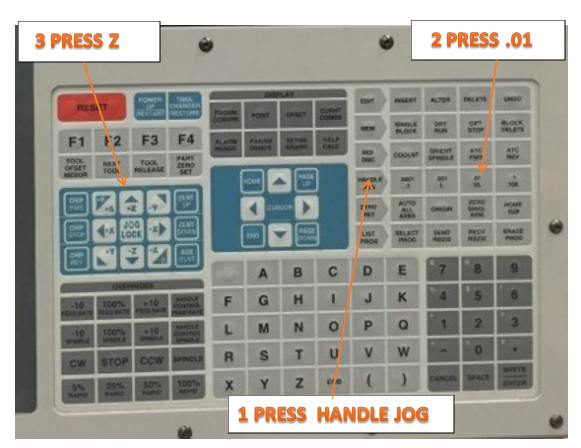 Press (HANDLE JOG) (E). speed when the handle is turned). 6. 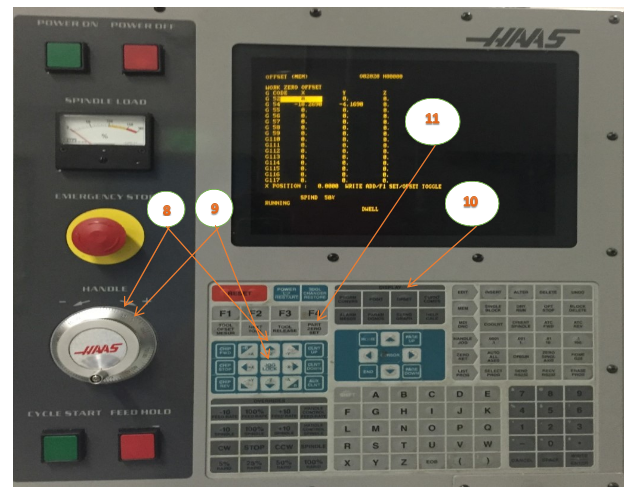 Handle jog (J) the Z-Axis approximately 1″ above the part. 7. Press (.001/1.) (G) (The mill will move at a slow speed when the handle is turned). 8. Handle jog (J)the Z-Axis approximately. 0.2″ above the part. of the part (See Figure 36 above (9). 10. Press (OFFSET) (C) until the Active Work Offset pane is active. 11. Cursor (H) to G54 X-Axis column. press of [PART ZERO SET] (B) loads the value into the Y-Axis column. a line of machine code. 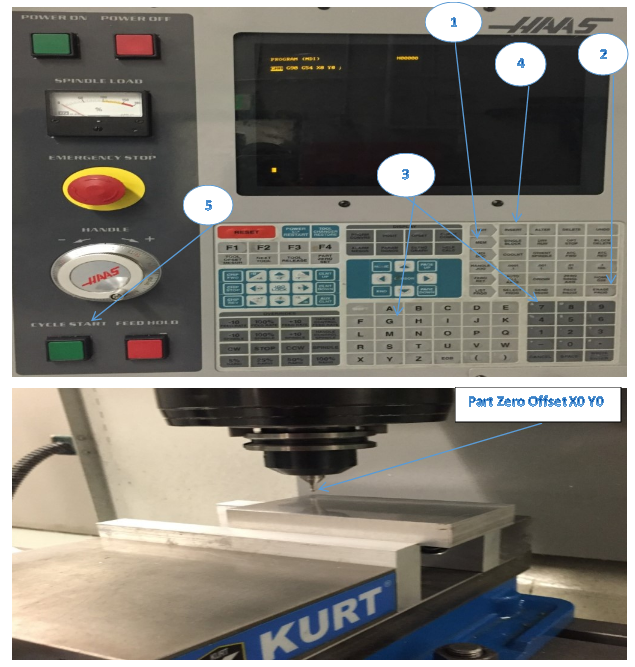 The distance for each tool is entered into the Tool Offset Table. from the tip of the tool (1) to the top of the part (2). See Figure 15. 1. Load the tool in the spindle (1). 2. Press (HANDLE JOG) (F). 3. Press (.1/100. )(G) (The mill moves at a fast rate when the handle is turned). 4. Select between the X and Y axes (J) and handle jog (K) the tool near the center of the part. 6. 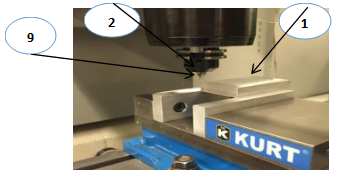 Handle jog (K) the Z Axis approximately 1″ above the part. 7. Press (.0001/.1) (H) (The mill moves at a slow rate when the handle is turned). down to the top of the part, as close as possible, and still be able to move the paper. 10. Press (PAGE UP) (E) until you display the Program Tool Offsets window. Scroll to tool #1. 11. Cursor (I])to Geometry for position #1. 12. Press [TOOL OFFSET MEASURE] (A). The next step causes the spindle to move rapidly in the Z Axis. 13. Press (NEXT TOOL) (B). 14. Repeat the offset process for each tool. 3. Cursor: Press the left arrow key to I/O and then the DN arrow key to move the highlight bar to Disk Directory. 5. Cursor ( Disk Directory): Press the DN arrow key to program to load. 3. Cursor: Press the left arrow key to I/O and then the DN arrow key to move the highlight bar to Send Disk. This is the preferred process for running a new program. Once a program is proven, all feed rates can be set to 100% and single block mode can be set to off. The machine executes all motions exactly as programmed. Do not use a work piece in the machine while dry run is operating. The Dry Run function is used to check a program quickly without actually cutting parts. 1. While in MEM or MDI mode, press (DRY RUN). 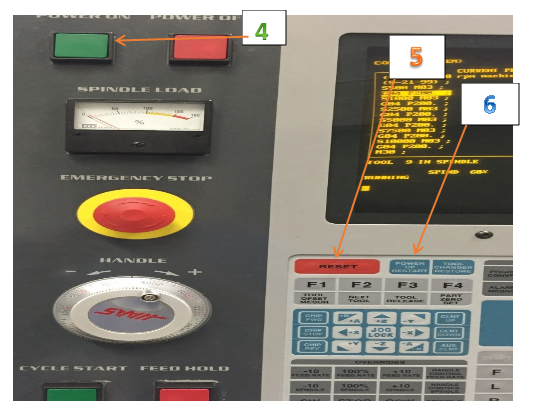 When in Dry Run, all rapids and feeds are run at the speed selected with the jog speed buttons. changes. The override keys can be used to adjust the Spindle speeds. Ensure vise or fixture is secure and that you have a safe setup. There should be no possibility that the work holding will fail to perform as required. Clear the work area of any tools or other objects. Turn Single Block Mode On. Press Rapid Feedrate -10 button eight times to set rapid Feed Rate Override to 20% of maximum. Place one hand on Feed Hold button and be ready to press it in case there are any problems. A common error is setting the Fixture or Tool Length offset incorrectly. When running a program for the first time, set the machine to Single block mode. Reduce rapid feed rate to 25%, and proceed with caution. Once the tool is cutting, turn off single block mode and let the program run. Do not leave the machine unattended, and keep one hand on the feed hold button. Listen, watch chip formation, and be ready to adjust cutting feed rates to suite cutting conditions. Wear compensation is used only on contour passes. It is not used for face milling, 3D milling, or drill cycles. Select the Wear Compensation option in your CAD/CAM software and, if needed, set a Tool Diameter Wear value as shown above. When used, the wear value is always a negative number. 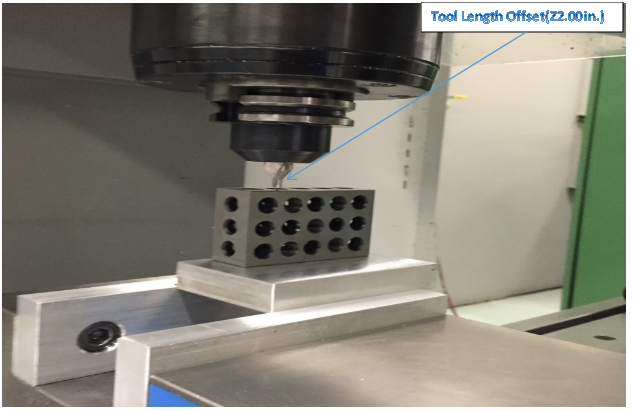 Always set Tool Diameter Geometry to zero for all tools since CAD/CAM software already accounts for the tool diameter by programming the tool center line path. Pg Up/Dn to highlight the tool to be adjusted. 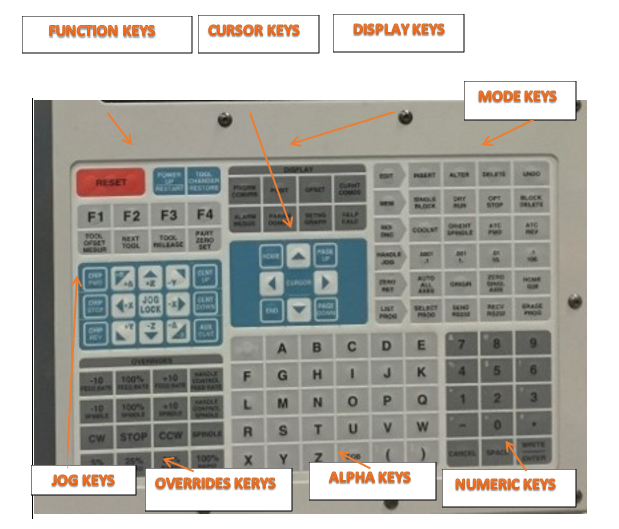 Enter a value using the numeric keypad. Enter the number of an empty tool carousel. • Wipe spindle with a soft clean rag to remove coolant and prevent rusting. • Clean up work area. • Always leave the machine, tools, and equipment in the same or better condition than when you found them. It is important to clean the machine after each use to prevent corrosion, promote a safe work environment, and as a professional courtesy to others. Allow at least 15-30 minutes at the end of each class for cleaning. At the very least, put away all unused tools and tooling, wash down the machine with coolant, remove standing coolant from the table, and run the chip conveyor. 1. 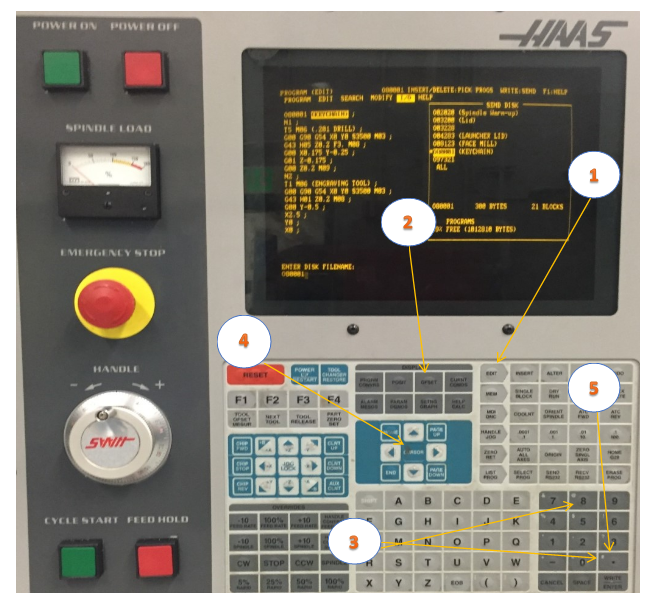 Please lists eight functional areas of HAAS Keyboard. 2. 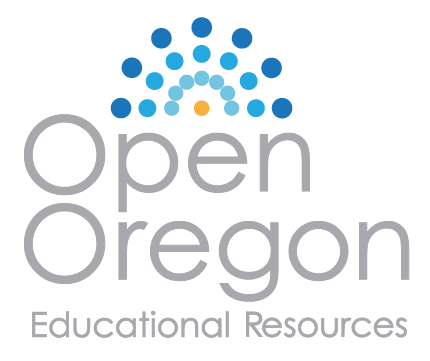 Describe how to Door override. 3. Explain how to load Tools. 4. Describe MDI and give one example. 5. Explain how to set part zero offset. 6. Please describe using MDI to verify part zero offset. 8. 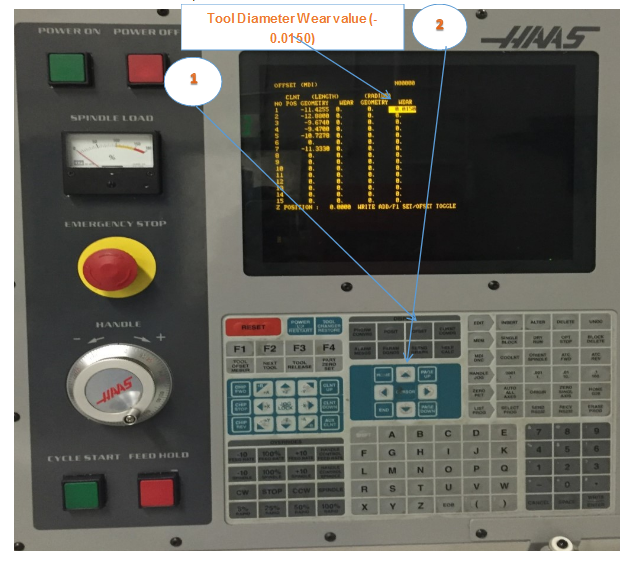 Please describe using MDI to verify Tool Length offset. 9. 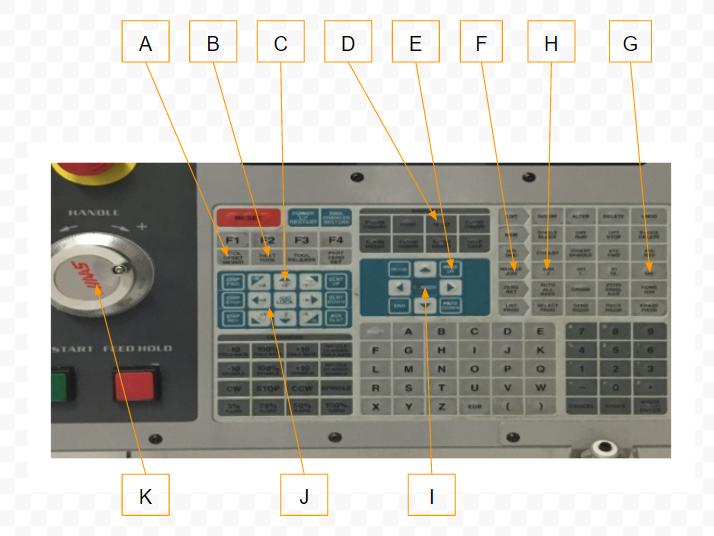 Describe how to save CNC program. 10. Please Explain the shut down procedure.